What was left of original crew. Miller and Moore had left. 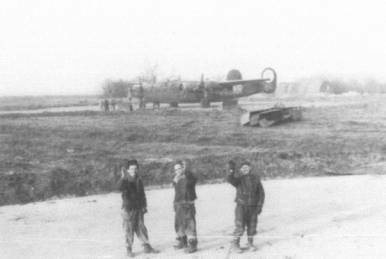 Taken April of 1944. For the first four missions, the crew flew in several different planes. They got "their" plane, B-24J-85 CO 42-100281 on March 13, 1944. 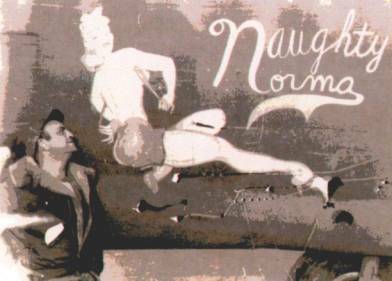 When they got the plane, the "boys" said they wanted to name it Naughty Norma. Forsyth gave them full permission to do whatever they pleased as long as it would pass inspection by someone higher than him. He said, "I wasn't going to get my own crew mad at me. Those guys are gunners! My life depends on them." They had permission to name it anything they wanted within reason and pay whatever they wanted to have the name and artwork done. 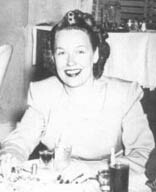 Prueher could not remember if all of them paid for it or just the enlisted men. He said he probably through in $5 or $10 but he doesn't remember what was charged. 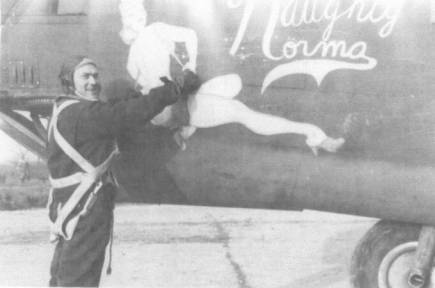 Each of the guys donated some money to have some guy there on the base paint the nose art. I was told that the man used a magazine, calendar or something to look at as a model. John Forsyth says it was a picture of Lana Turner. They don't remember the name of that guy. "That's naughty" or "This is naughty". That is how 42-100281 got the name. Prueher did think that perhaps Norma might get a little "earked" at being so named. But she wasn't. I guess that at one time, they painted the entire planes camouflage. They later realized that this added another 50 pounds to the plane. So by the time 42-100281 came along, they just left it silver. 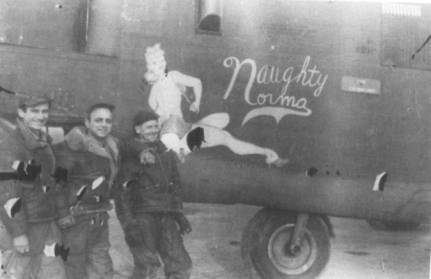 In January 2003, I had the idea of taking the nose art and Naughty Norma name and putting it on a 100-scale model of a B-24. All of the pictures we have of 42-100281 are in black and white. I thought it would be fun to find out what color the original painting was on the plane and make it as real as possible. I contacted each of the crew members to find out what colors had been used. Much to my surprise, not one of them could remember. The best I could get were some guesses. John said he thought she maybe her "bathing suit" was green or blue, her hair may have been blond and he had no idea what color her shoes were. He said he was "up above her" and I would have to ask the other guys. 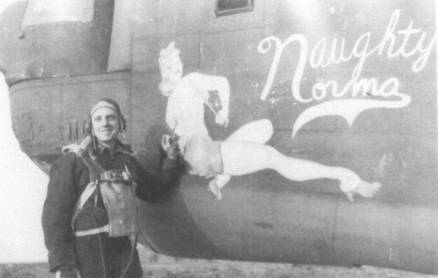 He did tell me that the nose art and name were only on the one side of the plane. He wasn't sure why. 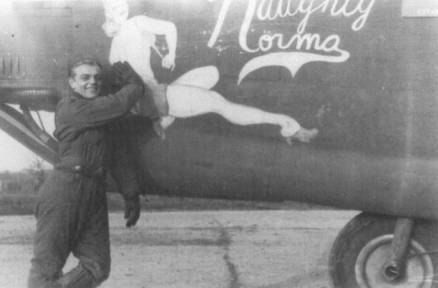 He said most of the planes that had nose art only had it on the one side. Maybe it has something to do with the cost of having it done. He said maybe it was only half as much that way. I ask if maybe that is why Norma was only half dressed. We both laughed. 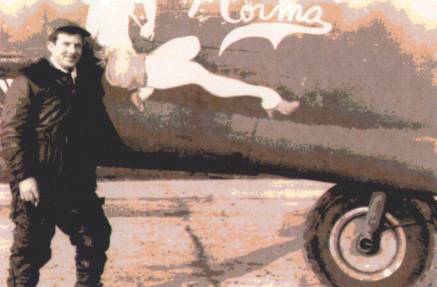 He also said that he know that the man who painted it had used the same picture on two or three other planes. 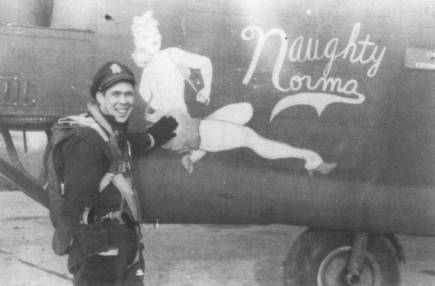 Joe on the other hand, said he thought that the Norma on the nose art had brown hair, a brunet. He didn't even want to guess as to what color her cloths were. Said "he couldn't be of much help". Will the real Naughty Norma please reveal herself? Click here to see how Norma made her rounds. 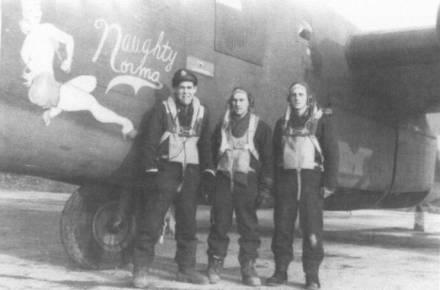 Forsyth, Prueher and Mulqueeny flew every mission with my Dad. 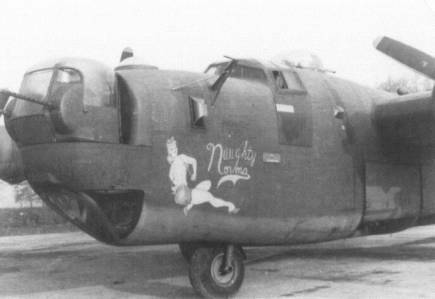 These are pictures of the same B-24 whose nose art photo is in "LIBERATOR ALBUM" page 39 of By Mike Bailey with Tony North (ISBN 1 85780 060 5). It was B-24J-85 CO 42-100281. Its call letter in 566th Sq. 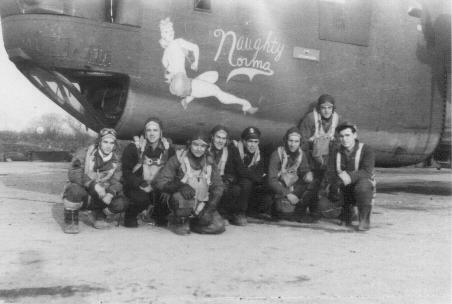 was D+ and from mid-March 1944 this was displayed on the fuselage as well as on the tail in addition to the squadron code RR. Crew Chief - He was on flying status later and was shot down over Germany and killed. For a long time I did not know the name of the crew chief or any details of his death. However, thanks to Kelsey McMillan, I can now honor this man with his name and not just his service. M/Sgt John M. Gantus was a member of the original ground echelon that trained in the States. 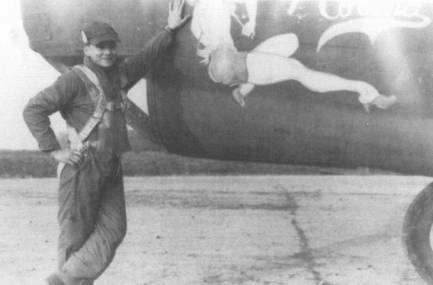 According to his friend and fellow crew chief John Petrocelli, Gantus desperately wanted the war to end and he would be able to go home. 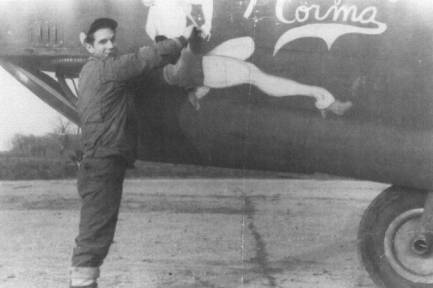 He thought that if he could get on a flight crew he could get home quicker instead of waiting until the end of the war. 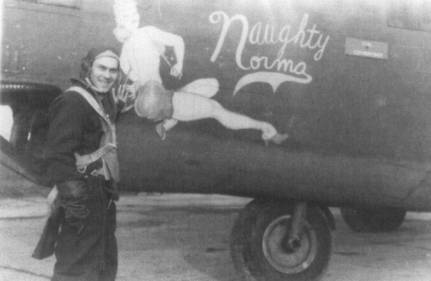 Several friends tried to talk him out of it but in December 1944 he switched to aircrew duty as a flight engineer/top gunner. 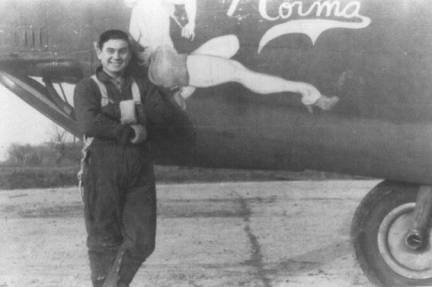 He flew 20 of his needed 30 missions successfully. However, on his 21st missing on March 23, 1945 he was killed in action. Gantus's crew lead the Group and the 2nd Combat Wing to the Munster marshalling yards in support of the Allied ground troops' assault across the Rhine River. The bombing was accurate but Gantus's plane took a direct hit at the junction of the right wing and fuselage. Gantus was killed along with seven others on the William Boone crew. In just a few weeks the war would be over and he could have gone home with the rest of the ground crew. Gantus was one of many ground personnel who volunteered for combat that Kelsey featured in an article for the Heritage League Herald, January 2006. In August 2006 I received a email message from John Gantus the Nephew of this hero. John M. had two siblings; George and Alice. 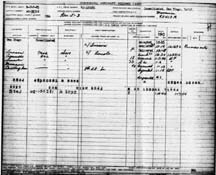 It looks like he was born in Rhode Island and moved to San Gabriel, California with his family in 1931. He was only 30 years old when he died. He was a real personality type person unlike his brother and sister who were more “serious”. John is buried at the American Cemetery in Neupre, Belgium. His honors and burial spot can be found on the website of the American Battlefield Memorial Commission. John’s nephew, John visited the grave site which he describes as “Ground Zero” for the Gantus family. John also has a son named John so the namesake is being passed along. The Gantus family seldom spoke of John. Even thought it was a devastating loss, they just “sucked it up” and went on with life. However his mother never quite recovered. Ground crew - crew chief, John M. Gantus in middle of both pictures. 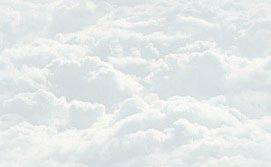 To go to early days of traning. Home To go to the first 28 missions.